Billie Joe Armstrong, Selma Blair, Judy Greer et al. 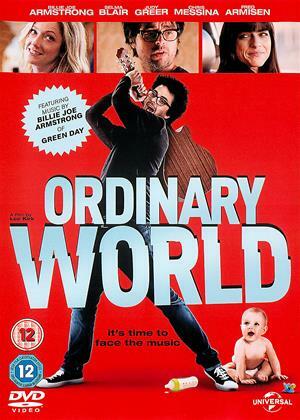 Billie Joe Armstrong leads an all-star cast in the candid and heartwarming comedy, 'Ordinary World'. A former punk rocker (Armstrong) is ten years into his band's "indefinite hiatus" and is struggling with his adjustment to the real world which includes working in his family's hardware store. When Perry's hotshot attorney wife (Selma Blair) and precocious young daughter forget his 40th birthday, his brother (Chris Messina) takes pity and gives him the money to throw a huge rockstar blowout in a fancy New York hotel. At the party, Perry's punk past clashes hilariously with his arown-uo realitv as he encounters crazv former bandmates. including best pal Gary (Fred Armisen), and an old-flame-turned-manager (Judy Greer), who offers him a chance to revive his stalled career, all in one outrageous day!